*SOLD OUT* Thank you for your support! TOGETHER FOR THE FIRST TIME !! Official Iditarod Artist Jon Van Zyle and Official iditarod Photographer Jeff Schultz combine their talents in one image to help in the care of Jeffs’ son, Ben Schultz, who was severely injured in a 100 foot fall as an Anchorage fireman with a traumatic brain injury. 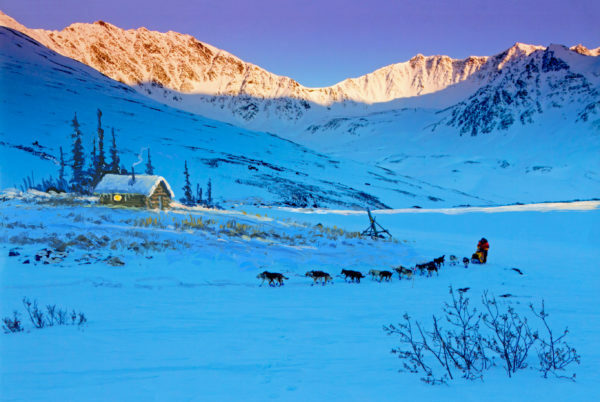 Jon VanZyle has added his talents of painting to one of Jeff’s photographs of Mitch Seavey mushing in the Alaska Range near Rainy Pass during the Iditarod to create a one-of-a-kind piece of art. In a limited edition of 125, hand-signed and numbered by both artists, the 18” x 12” artwork is printed on metal with a high-gloss surface and is ready to hang. 100% of all the profits from this artwork will go towards the support of Ben Schultz families’ expenses during Ben’s recovery process. (sorry no international orders). Orders will begin shipping the second week of October, 2017. Cutoff for ordering is December 31, 2017. Allow up to 3 weeks for production and shipping. Local Pickup– $5.00 packaging fee for those who prefer to pick up their art print in person in Anchorage. Once you place your order and your order is ready for pickup, we will email you the Location information for pick up in Midtown Anchorage. Sorry, no reservations of specific edition numbers available.